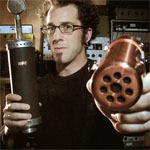 Engineer Joel Hamilton discusses some of his favorite microphones and techniques for recording vocals. Lo and behold the Copperphone is one of them. Read the full article in Mix Magazine Online here.